Microsoft came out with its first tablet, The Microsoft 10.6" Surface Tablet at Los Angeles this week.The Microsoft 10.6" Surface Tablet is a large sized tablet compared to the Galaxy Tablet and the iPad Mini.The Microsoft 10.6" Surface Tablet has a very unique feature, which is not seen in any other tablet at this point in time, this feature is the Kick-Stand to support the tablet screen while watching movies, playing games etc.The screen comes covered with Gorilla Glass. 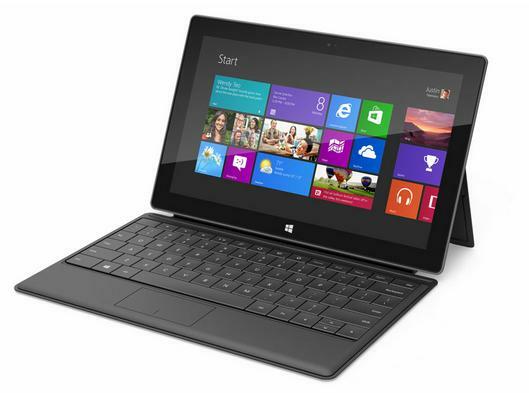 Microsoft 10.6" Surface Tablet is just 9.3 mm thick and comes in two variants, 32 GB and 64 GB.Like the expected iPhone 5, the Microsoft 10.6" Surface Tablet is expected to be made of liquid metal which greatly reduces the weight of the gadget. The price in India has not yet been disclosed, we will have it to you as soon as it is.